A new piece in the wake of the revelation of Anjem Choudary’s conviction for the Guardian looking at the question of the importance of leadership in terrorist networks and what his detention means. The article is a bit less declarative as the title, but there we go. Also spoke to BBC Today about Choudary’s arrest and they have used the clip on their podcast which can be downloaded here and bits of it got subsequently picked up here. Separately, also spoke to NPR about his arrest and what it means for the UK. The conviction of Anjem Choudary marks a significant moment in the history of British jihadism, but it is unclear what kind of an impact it will have. Terrorist groups and networks do suffer when they lose charismatic leaders. Their removal is unlikely to completely destroy a group, but it does change the dynamic. Terrorist networks are, at their core, groups of people gathering around an ideology. Individuals are drawn in for various (often deeply personal) reasons, but to function as an effective unit that works to advance an ideology requires organisation and leadership. Otherwise, it is just a cluster of angry people with no particular direction. It is here that leadership figures are key. They provide direction and can help motivate others, as well as offering some practical experience and, crucially, contacts. An individual who has risen to the top of a terrorist network after a long period of time will develop an understanding of what works. The relationships they will have developed over time are hard to replicate. Choudary is a prime example. 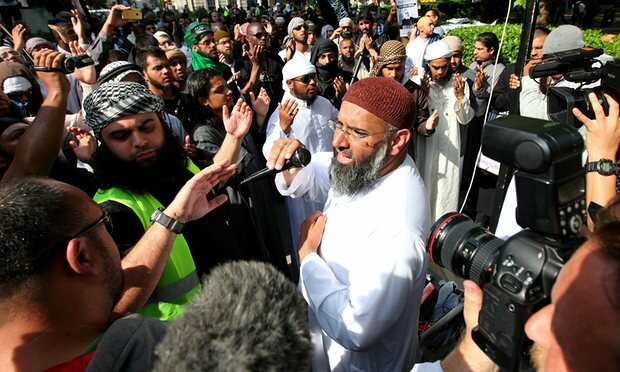 Involved in the formation of the UK-based jihadist group al-Muhajiroun in the mid-1990s, Choudary had pedigree and trust among the community of individuals drawn to the group as well as the wider extremist community. This included those who joined the group pre- and post-9/11. He understood the mechanics of how to organise protests and attract media attention, providing the kinds of soundbites news organisations wanted to use. And he was a charming and charismatic fellow who would make people laugh while he told them about the brutal punishments that would be meted out in the perfect Islamic state he was seeking to achieve. All of this made him a very persuasive figure to the lost or curious young men and women who were drawn to him after seeing or hearing him in the press. In his absence there is no doubt that the network will suffer to some degree, even if Choudary’s own reputation is enhanced to some degree by the perception that he is martyr to the cause, possibly adding to his street cred among followers when he is released. Other terrorist groups and networks have suffered as a result of the loss of such figures. The Shining Path in Peru largely shrank back into drug smuggling networks after its leader Abimael Guzman was arrested in 1992. Al-Qaida has never quite been the same since Osama bin Laden was killed and the less charismatic Ayman al-Zawahiri took over. After Abu Musab al-Zarqawi was killed, al-Qaida in Iraq faced a period of decline. In all of these cases, the groups did find ways of picking up or evolving subsequently, but the removal of leadership figures had a noticeable impact. 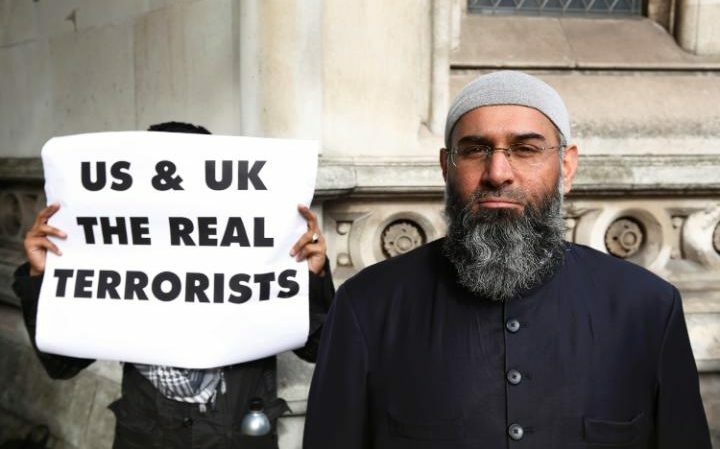 The jailing of Choudary for a few years will not end the story of British jihadism. Partially because there are others like him, but also because the narrative he was espousing has entered the mainstream to the extent that his role as a megaphone for radicalisation is less important. But his imprisonment will have an impact on his immediate group and some of the contacts he had developed over time. For some time at least, he will be silenced and unable to spread his hateful ideology so publicly. Unless he is managed carefully, it is possible he might end up causing some damage in prison by radicalising fellow inmates, but the mere fact of his removal from the public conversation for an extended period will certainly do no damage to the cause of countering terrorism in the UK. Meanwhile, some of the people who were drawn into Choudary’s orbit and subsequently groomed or recruited by jihadist networks will, thanks to his absence, have a new hurdle to cross. Catching up on another late post, this time for the Financial Times Beyond BRICS blog looking in some detail at the question of how the ‘Belt and Road’ has had an impact on Xinjiang-Central Asia trade. Trying to look at this as a case study for the bigger question lots are asking. Am immensely grateful to the excellent Anna Sophia for doing some excellent digging to get the numbers for this. As ever a topic that will get more coverage as we go forwards, and check out China in Central Asia for more on this larger topic. The Xinjiang Uighur Autonomous Region government is an active player in the BRI. Under its auspices, Xinjiang’s major energy companies are expanding Chinese energy trade with Central Asia. Following its promotion as one of seven national centers for the development of Chinese wind power in 2014, the Xinjiang-based wind turbine company Goldwind won contracts to build plants throughout Central Asia in 2015. In addition, the Tebian Electric Apparatus Stock Company, one of China’s major power transformer companies located in Xinjiang, announced in 2015 plans to build a power transformation line in Kyrgyzstan and a power station in Tajikistan. Xi Jinping, the Chinese president, called the power station in Tajikistan a symbol of the growing “friendship” between China and Tajikistan, highlighting Xinjiang’s importance to the political and economic objectives of the BRI. In addition to this corporate activity, the Xinjiang Communist party leadership has represented Beijing in Central Asia. Zhang Chunxian, Communist Party Secretary in Xnjiang, has formalised trade partnerships initiated by Mr Xi with Tajikistan and Kazakhstan. These include deals on agriculture, infrastructure and trade with Tajikistan after Mr Xi’s 2013 visit and a $2bn trade deal with Kazakhstan. Thus, Xinjiang is serving to implement the leader’s vision. These BRI deals, however, do not in fact represent a departure from Xinjiang’s trade history. Special trade relationships with Central Asian states existed before the initiative was announced, and energy and commodities were already important in its regional trade. The Kashgar Special Economic Zone was established in 2010 and is intended to deal primarily in regional commodities exports. Likewise, plans for the Kazakhstan Khorgos Border Cooperation Center, where duty-free trade between Kazakhstan and Xinjiang could occur, were already announced in 2011, though construction did not begin until 2014. The point being that many of the projects now tagged as BRI are in fact pre-existing projects that are being re-branded. The lack of change in Xinjiang’s trade volume since the BRI was announced calls the connection between the broader vision and the deals into question. In 2015, Xinjiang’s trade volume with Central Asia declined more rapidly than the national volume, while experiencing a reduction in trade with every Central Asian country aside from Turkmenistan, which was involved in building a new pipeline to the region. Xinjiang’s textile exports have increased in 2016, according to the Global Trade Review. However, textiles were already a significant part of Xinjiang’s trade to Central Asia, so the rebound may merely be the result of a weak 2015 base. 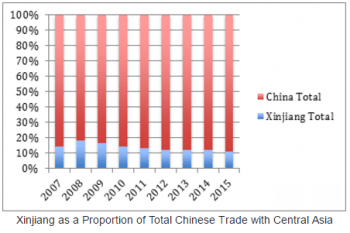 The discrepancy between Xinjiang’s visibility in the BRI and its steady proportion of China’s total trade with Central Asia suggests that – so far – the initiative is simply publicising trade relations that existed before, instead of changing China’s trade patterns. If this pattern holds, it will be important for countries that deal with China to look beyond the visionary rhetoric of the BRI and engage instead with concrete and bankable projects. This requires a focus on what made sense before the BRI was announced. Raffaelo Pantucci is director of international security studies and Anna Sophia Young is a research intern at the Royal United Services Institute (RUSI), a think tank based in London. How Long Will The UK Be Spared An Extremist Attack? Catching up on posting late again, this time an article for Newsweek looking at why the UK has not yet faced an attack in the current wave we see sweeping across Europe. The United Kingdom threat level from international terrorism is currently set at “severe.” This means that the security and intelligence agencies believe that “an attack is highly likely.” It has been at this level since August 2014 when it was raised in response to developments in Iraq and Syria including the increased number of foreign fighters travelling to the Middle East from Britain and Europe. Since then we have seen the extremist threats in Europe mature and become more acute, while the U.K. has so far been spared an attack. It is difficult to know why that is the case. It could be thanks to effective efforts by security and intelligence agencies, or it could be because the Islamic State militant group (ISIS), Al-Qaeda or other groups do not currently have the capacity to launch an attack on British soil. It is known that ISIS would like to launch attacks in the U.K.—aside from European returnees from the group such as the British former militant Harry Sarfo telling us, there is also the question of the links to the U.K. of the network that carried out the Paris Attacks on November 13 2015, as well as the regular appearance of British imagery in ISIS videos. The U.K. is seen as one of the key western powers that are fighting the group, and striking it would be an attractive option. So far, the threat picture has been quite disparate. There have been plots that appear to show evidence of some external direction and coordination, others in which individuals appear to be working in conjunction with contacts abroad including the infamous ISIS hacker and recruiter Junaid Hussain, and plots which appear more in the lone wolf mold. In the wake of the current spate of incidents in France and Germany, it is clear that intelligence agencies and police forces in the U.K. will be ramping up their capability. The use of new—and very basic—methodologies like a truck to run down crowds, will lead to a re-think on how best to prepare and conceptualize against such an attack. One solution is to build more heavy street furniture like bollards that prevent vehicles from driving on pavements. The tactic of publicly decapitating someone has already been seen in Britain, with the murder of the soldier Lee Rigby in 2013. It was also mooted even earlier in 2006 when a man named Parviz Khan planned to kidnap and decapitate on video an off-duty British soldier. Security forces are alert to this threat, and beyond raising concerns among a larger community—with religious establishments now an even bigger target than before—there is not a huge amount that can be done. Synagogues have had security guards for some time, and they have started to appear at some mosques, but it is unlikely that we will see them at every religious establishment in Britain. The biggest lesson to be drawn from the current spate of attacks is the contagious nature of this phenomenon.This is not a new phenomenon—when dramatic extremist incidents take place, they tend to generate copycat attacks—success breeds emulation. The British reaction should be to try to understand better how these events are triggered and to identify those plotting similar attacks in the U.K.
British authorities will also be exploring the implications of the fact that the 19-year-old who attacked the priest in Rouen was already on the security services radar, was subject to some form of electronic tagging and had already been incarcerated. The fact that an individual who tried to travel to Syria twice was not considered a priority case either suggests that the system in France is dangerously overloaded, or that the question of correct prioritization remains a concern. This is something all intelligence agencies face. In a world of incomplete information, multiple potential threats and targets and limited resources, prioritization is essential. Choices are made on the basis of available information and this means some individuals are given less attention. In this case, as with the Charlie Hebdo shooters and the Lee Rigby murderers, the decision was made to pay less attention to the eventual terrorists than others on watch lists because their activity did not seem to merit it. This question of who to focus on is a continual problem for the intelligence services and this particular failure will undoubtedly make British agencies re-consider some of their approach. Greater attention will also be paid to reforming the U.K.’s existing Terrorist Prevention and Investigation Measures (TPIMs) system. So far a number of people on them have been able to abscond to Syria, though fortunately none have launched attacks like that seen in Rouen. The latest incident has shown what failure can look like, and making sure similar slips do not occur in the U.K. is going to be a priority. While Britain has been lucky so far, the intent by groups such as ISIS and Al-Qaeda continues to cause serious concern. The U.K. has at least 800 foreign fighters who went to Syria and Iraq, and has a constituency of radicalized individuals at home who support ISIS. Lone wolf attacks can occur at any time, in any place and no security service has yet found the perfect solution to counter them. 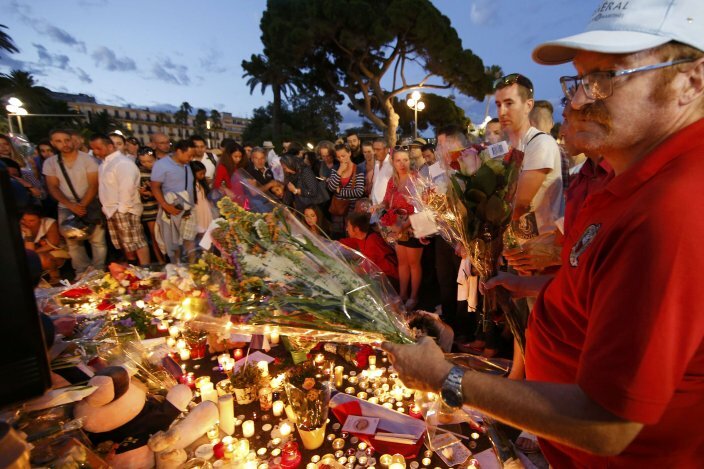 While some practical realities are different—the ease of access to high powered weapons for example or the completely open borders—between the U.K. and Continental Europe, as the Nice and Rouen attack showed you do not need a sophisticated weapon to cause a successful high profile incident, and it is not always clear if closed borders would have stopped anything. Currently, British security services will be focused on supporting their continental counterparts who are facing a particularly acute threat that could still be escalating. Until we know more about the trajectory of this wave of attacks, it will be difficult to know why the U.K. has been fortunate so far been spared. Raffaello Pantucci is director of International Security Studies, Royal United Services Institute.